A delicious German noodle casserole which goes very well with a green salad on the side. Bring a large pot of lightly salted water to a boil, cook the Spaetzle as per instructed time, then drain and set aside in pot. In a large frying pan add the Rama Margarine, Onions, and Bacon and bring to sizzle, cook until Onions are golden. Add 250ml of the whipping cream and nutmeg and black pepper to taste. 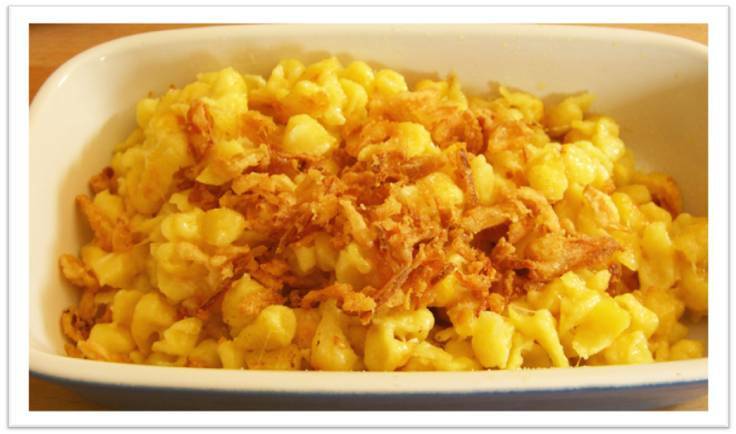 Add the Onions and Bacon mix and 150g of your chosen cheese to the Spaetzle and mix together lightly. Pour the Spaetzle into a heat resistant casserole, spread evenly and sprinkle the remaining cheese on top, bake at 390 degrees for about 15 minutes. Remember to stop by our Deli for the freshest Rama Margarine, Spaetzle, and a variety of cheeses and deli meats!